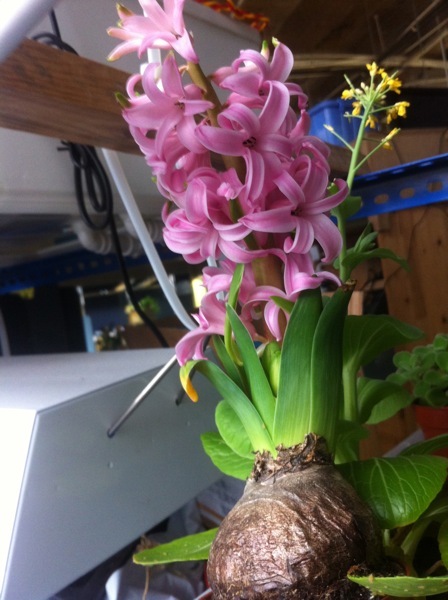 Although I always say using aquaponic for ornamental plants is a bit wasteful, I recently put a Hyacinthus bought in the flower market into the small desktop system without digging it out of the pot and soil the plant came in with. The bottom of the pot is open for drainage. By embedding the bottom into the clay balls, the water is getting wicked up to water the soil. The oxygen and nutrient rich water does the plant a lot of good and flower about a week faster then expected. Given small sample, this is not really a good test for the efficient. 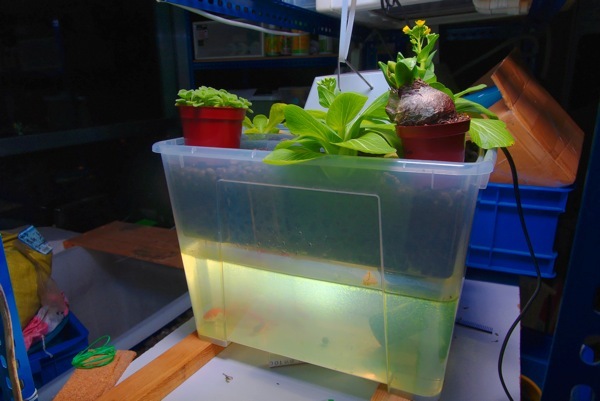 However, it gets me thinking about other use of aquaponic in home. Here is a few advantages for home use. No watering required! The the circulated water from the aquaponic system gets wicked up into the soil to maintain optimal moisture level of the soil while preventing the water lost from watering from above. This is great for busy city life. No repotting. Hyacinthus is supposed to be repotted to get enough nutrient for flowering. However, with nutrient and oxygen water from the aquaponic system, that's not necessary.